Marvel Netflix - Sweet Christmas! New thread, last thread is almost full. I heard that we might get a full Iron Fist promo on the 8th at the NY Comic Con. Iron Fist to launch MArch 17th 2017 and the Punisher has started filming. Looks very much like we'll get Iron Fist, Defenders and Punisher at the end of 2017. Guessing JJs2 will be march 2018 then Daredevil? Looks like they are gearing up to 3 shows a year. Defenders is 8 episodes and I'm pretty sure Punisher was less than 10. So they should be able to guage how manageable it is. Besides funding it appears all the shows have their own crews. Damn it, now I just want Iron Fist. So, I was wondering if the MCU and Netflix aren't really viable for Netflix characters to go from small screen to big screen, what about Spideyverse? Now that Sony and Disney/Marvel are playing nice, and NYC is the playground for Netflix and Spidey, it seems like there is scope for some cameo or even supporting appearances of Netflix characters in Spidey, and maybe even Spidey in Netflix. I could see Spidey putting in an appearance in Defenders Season 2. 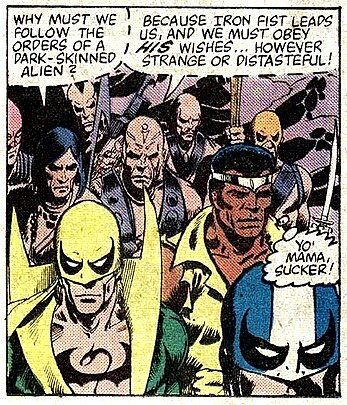 It seems like the antagonist in Defenders seasons should be on a sort of grand scale of threat that could call for Spidey to be involved, or that would be odd that Spidey would not be in the mix. But not on a grand enough scale that other Avengers would need to step in. 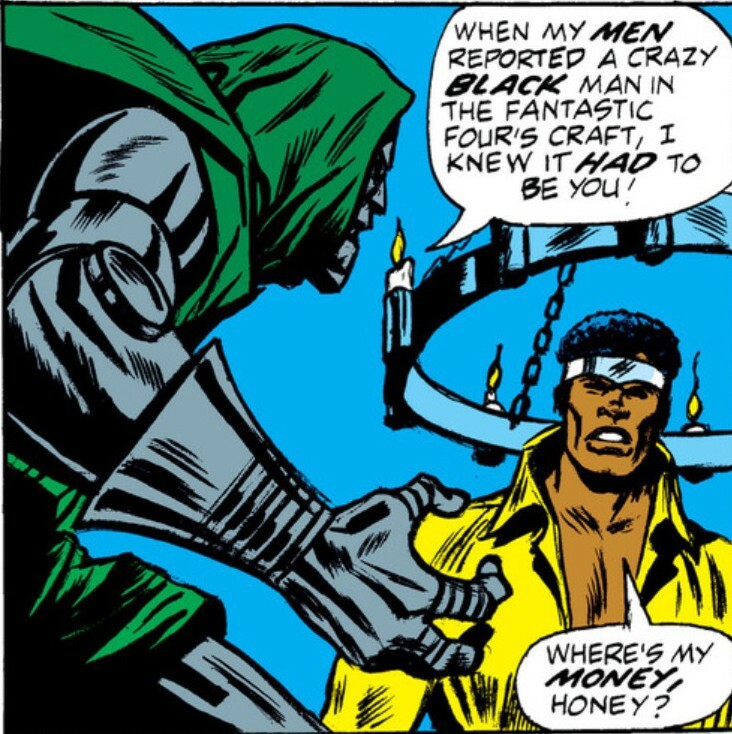 As a Hulk-lite dude I think Luke Cage is a very good candidate for putting in an appearance in a Spider Man movie. Though I think some interplay between PPs youthful enthusiasm and naivete and JJs bitter cynicism would be fun too. I guess Sony is craving the MCU connection so it's possibly more likely than netflix to marvel film. It just depends on whether TV is seen as "beneath" Spider-man. I'm not saying it is but Sony might think "if Thor and Iron Man don't then Spidey shouldn't either"
I just want Heroes for Hire. The Denny O'Neil to Kurt Busiek run of that book was one of my guilty pleasures back in the day. So goofy. I was disappointed we didn't at least get a short teaser at the end of Luke Cage like we got at the end of Daredevil season two. There's a quote somewhere where Fiege says the Spiderman deal is very specific and doesn't allow for him to appear in their TV shows. I wouldn't even be sure Marvel is allowed to use Spidey characters outside of films that are co-produced with Sony. Sigourney Weaver to play a villain in Marvel's Defenders. Yes!!! This looks really great and it looks like Colleen will be a love interest of Danny and I'm okay with that. I also think Colleen will be a badass Samurai. I hope we get at least a mention of Shang Chi this season. And Woll will be in the Punisher, which was probably the right choice, they had some of the best (non-fight) scenes in D2. Apparently she was very popular in the hall. Danny walks up to the reception desk of the Rand Enterprises building and tells the receptionist that he’s there to see Harold Meachum. “I’m Danny Rand, son of Wendell Rand.” Danny additionally looks around the lobby of the expensive building, reminiscing about his childhood, “I used to ride my skateboard in here.” The receptionist placates Danny by saying someone will be out to see him. Danny wanders over to a screen that depicts the work of Rand Enterprises, including shots of new technology as well as farming industries. Then, the screen depicts Harold Meachum and Wendell Rand shaking hands as partners of the company and Danny is shown reacting with confusion. However, security shows up and forces Danny out of the building. He stays outside for a few moments before (badly) attempting to sneak back in, and when that doesn’t work, Danny easily takes on a number of security guards. Danny fights his way through the lobby using his skills and locks himself into the elevator bank. The final shot of the scene sees Danny getting on an elevator. The scene works to introduce both Danny Rand – including his childlike wonder of returning to New York City – as well as the action that fans can expect from Iron Fist. It’s typical of Marvel to also include plenty of humor within its properties and Iron Fist is no different; the shot of Danny attempting to sneak back into the building is played for laughs and hints at a silly side to Danny Rand in Iron Fist. Danny begins by telling Ward accusatorily: “You were like a brother to me.” Danny goes on to accuse Ward of sending someone after him, knowing it was Ward because he was “the only one with me the day I broke my arm.” The pair continue to argue, Danny asking Ward why he hates him so much and Ward declaring that, “The Danny Rand I knew is dead.” Their argument gets more heated until Ward smacks a glass off the table; Ward and Danny stand up to face each other, but Joy gets in between the two men. She says to Danny, “I’m not your sister, he’s not your brother, and we don’t want you here.” There’s a beat while Danny reacts to Joy’s words, he’s hurt and betrayed. Joy attempts to placate Danny, but he proclaims that he’s hired Jeryn Hogarth (Carrie-Anne Moss) and he’s going to take control of his part of Rand Enterprises. Although the scene is taken out of context, it seems clear that Danny hopes to follow in his father’s footsteps by working at Rand Enterprises and Joy and Ward are not happy with his reappearance since it likely created plenty of problems for the Meachum siblings. Still, there’s an emotional throughline of the scene that showcases the relationship between Joy, Ward, and Danny prior to Danny’s disappearance. Plus, the scene explains why Moss’ Jeryn Hogarth will appear on Iron Fist after being introduced on Jessica Jones. The scene cuts off before Danny gets into the elevator but Loeb confirmed after the scene screened that Danny does make it into the elevator – though that was all he teased about the remainder of the scene. Based on the sequence, it appears Iron Fist will utilize Danny’s unique fighting style for their hallway scene, as well as some fun filming style – one part of the sequence is shown completely from the above. However, it remains to be seen how the remainder of the scene plays out. One of the men antagonizes Colleen by shouting to the crowd: “This little girl thinks she can fight me?” The man running the fight questions Colleen to make sure she wants to participate and when she answers yes, he locks the three fighters in the cage. Colleen quickly begins dominating the fight against both men, at one point headbutting one of the men’s fists to defend one of his punches. Colleen is pinned down by one of the men, but she knocks him out on the leg of the other man, though she’s stuck under the one that’s unconscious. The man still fighting pulls her out from under and she puts one of his arms in a lock until she breaks it. He attempts to keep fighting, but she gets the upper hand. Although he’s clearly lost, Colleen continues to punch his face, seemingly losing her control. The scene is a fantastic introduction to Colleen Wing’s talent for fighting, while additionally hinting at emotional turmoil within the character. As it was teased in the Luke Cage season finale and confirmed at the Iron Fist panel, Claire Temple will study under Colleen at her dojo. Given what was shown in this particular fight scene, Colleen will have plenty to teach Claire, and will prove to be a worthy ally for Danny Rand. When Danny wakes up, he’s confused by Harold’s presence. Harold asks if Danny remembers the song he used to sing when Danny was a boy in order to annoy him; the song is “Danny Boy” and Harold hums a few bars, setting a menacing tone for the scene. Danny tells Harold, “I thought you were dead,” and Harold replies, “And I thought you were dead, so I guess that’s something we have in common.” Harold digs for information into Danny’s time away from New York City, asking about the monks that took Danny in. Danny confirms he was in K’un L’un, one of the seven capital cities in Heaven. He additionally reveals that he understood his place there as a warrior. When Harold pushes Danny about his time as a warrior, Danny reveals he became “one in a long line,” a warrior known as the Immortal Iron Fist. Additionally, Danny says Iron Fist is the mortal enemy of The Hand, it is his duty to destroy The Hand, and that he is the only one who can do it. This final scene sets up an interesting dynamic between Danny and Harold, especially in the revelation that they both thought the other was dead. Additionally, the scene establishes The Hand – which was teased in season 1 of Daredevil and officially introduced in season 2 – as a major antagonist of Iron Fist. You have no idea how much I want Mavrel and Fox to work something out so Gorgon can appear as a Hand big bad. Since it seems Marvel/Disney has rights to The Hand they could surely create a character who is pretty much Gorgon in all but name, couldn't they? Call him Stone Gaze or something. After all, given the whole turning people into stone with a look dates back to ancient Greek mythology Fox can hardly get all pissy about a MCU character having that ability. I'm not a copy write lawyer, so I'm not sure. But Gorgon main trait that I like is his nihilism and (fairly justifiable) superiority complex. If the guys too similar to Fox's character they'll cry foul, and I think Marvel are currently trying to be nice to Fox. Same with Viper. Nihilism and a superiority complex is hardly a unique characteristic that would cause howls of complaint from Fox. If they don't bring in the whole turn to stone thing as a power of this not-Gorgon character and don't call him something that brings to mind the gorgons of ancient Greece then there's pretty much noting in it. Anyway, it's not copyright, since Marvel owns the copyright. It would be basic contract law regarding the terms of the licensing agreement between the copyright holder and the licencee. Ultimately what would probably stop Netflix from going there is Marvel not wanting to create super villains who are not in the comicverse.